Jupiter, Florida is not only not only a beautiful place to live and base a photography business but a spectacular destination for engaged couple to host their wedding. Jupiter’s climate, location, and prestige are all attractive, but when paired with local activities, attractions, venues, and restaurants, this part of South Florida becomes ideal for brides, grooms, and wedding guests alike. The year-round draw of northern Palm Beach County attracts people from across the world, including many New Englanders and New Yorkers who have chosen to build second homes here. This makes Jupiter feel like a home-away-from home for many couples, allowing a destination wedding to seem like it is actually in their own backyard. The recent growth throughout the Jupiter area, including Palm Beach Gardens, Juno Beach, and North Palm Beach, have only helped to increase the attractiveness of this region. Who doesn’t want an easy and relaxing beach getaway when the stress of the city becomes too much? While many places in the Sunshine State enjoy temperate beach weather twelve months of the year, Jupiter is situated well below the frost line which allows for beachfront fun in the sun even in January and February. Our climate is the primary contributing factor to our main tourist season being the opposite of much of the rest of the Eastern Seaboard, coupled with the overlapping timeframe of school vacations over Thanksgiving, Christmas, Hanukkah, and spring break. You can feel the difference in seasons not so much though the variations in temperature, but in the amount of traffic, the lines at the mall, and the wait time at our local restaurants. While we Florida natives barely notice the humidity and laugh off sweltering summer days, we certainly enjoy our cold snaps during winter, when the mercury can plummet into the mid-fifties. The snowbirds seem to adjust to the Florida lifestyle within a matter of days, as suddenly a cool, breezy night in February strikes them as though they were forging their way through a Boston blizzard, fur coats and all. Can a Hurricane Affect My Wedding? Besides the heat and humidity, Florida weather is synonymous with hurricanes and tropical storms, which will forever be paired in our minds with wedding insurance. For full disclosure, we do go up north for the summer and essentially skip hurricane season here, but for many years we photographed weddings during the peak of hurricane activity throughout southern Florida and the Florida Keys. We make sure to discuss wedding insurance with all of our clients who are planning their nuptials at a place or during a time that weather has an elevated chance of causing severe issues, though it’s a good idea for any cautious couple, regardless of their wedding location. August celebrations in Key West and September weddings in Key Largo are discounted for a reason, but a late October ceremony on Jupiter Island, while late in the official storm season, is still susceptible to the same potential weather problems. We believe wedding insurance is a must for our couples choosing to get married here during what we now consider our off-season. Jupiter’s geographical location is one of its greatest attributes and plays a large role in the operation of our wedding photography business. We view our local area as close to everything but just far enough away to maintain our small town feel. Close to West Palm Beach and reasonably close to Orlando, Tampa, and Miami, we enjoy a small buffer between our little corner of paradise and the crowded urban areas augmented by major tourist attractions. We can relax on our local beach and still see rockets launch from Cape Canaveral, or take a day trip to two different National Parks. We can take a short boat ride to reach the Bahamas to the east or drive just a few miles west and experience Old Florida’s charm through cattle country and citrus groves. Immediately west of the town of Jupiter is Jupiter Farms, which blends modern construction with classic ranch style homesteads, producing the strange sight of a horse grazing next to an Italian super car. We embrace our town’s unusual charm and celebrate its diversity. Whether you’re planning a destination wedding, an elopement, a "weddingmoon", or just planning a golf trip disguised as a family vacation, the accessibility of the area starts with air travel. Palm Beach International (PBI) is a twenty minute interstate drive south on I-95 and has numerous daily flights to the New York area (JFK, LGA, EWR, and HPN) in addition to Washington DC and Baltimore. We use this as a convenient jumping-off point to our Vermont market, but we are also a reasonable distance away from three other major airports. Driving about an hour south from Jupiter, Fort Lauderdale-Hollywood International Airport is substantially larger than PBI, and it serves as a major hub for our favorite airline, JetBlue. We frequent FLL when we travel west across the country to work in California, visit friends in Portland, OR, explore the National Parks around Seattle, WA, or venture out to our annual visit to Las Vegas, NV for WPPI, an bustling convention and trade show in the wedding and portrait community. Slightly farther south, Miami (MIA) is the main portal to South America for the entire United States. Growing up in Hollywood, FL, my family and I flew out of Miami to multiple destinations in Europe, Asia, and Africa, and those routes have helped make Miami such a diverse marketplace and true global city. In the other direction, Orlando (MCO) is about two hours north of Jupiter and while further away than Miami or FLL, the drive to the airport via Florida’s Turnpike is almost always more peaceful than fighting traffic in Broward and Miami Dade counties. No matter where you land, you’ll need to get out of the city and into the town, and our roadways all seem to lead to Jupiter. The final portion of I-95 was constructed right here in 1987, linking Ft. Pierce to West Palm Beach, and thereby officially connecting Miami with the border of Maine and New Brunswick. Driving down from the northeast has followed the I-95 corridor for decades, providing for countless road trip stories and subsequently spawning roadside attractions like South of the Border in South Carolina, creating a ridiculous stopping point roughly halfway through the journey. For the midwesterners, I75 serves and another artery from South Florida, through five other states, all the way to the Upper Peninsula of Michigan and another Canadian border crossing. North of Orlando, I-75 splits to allow access to Tampa, Sarasota, Ft. Myers, Naples and eventually Miami via the western route, while the central and eastern portions of the state are served by the other branch, Florida’s Turnpike. Jupiter is the meeting point for I-95, Florida’s Turnpike, and US 1. The main road through Jupiter, Indiantown Road, is amazingly only two turns away from reaching Florida’s Gulf Coast, several hours away. In the same way that we acquire a rental car for weddings that are destinations for us, we encourage visitors to the Palm Beach area to rent a car of their own or at least utilize the abundance of local and seasonal Uber drivers. Growing up here, I have always viewed the entirely of South Florida as an easily navigable grid. If it’s an exit from either I-95 or the Turnpike it’s an important road that runs east to west. If you see the ocean, you’re as east as you can go. When the buildings give way to farmland immediately, you’ve probably reached as far west as you’d like to go. While having A1A meander through the picturesque coastal portion of the town is a definite plus, having a different main road named Alternate A1A is perhaps not the best example of logical municipal nomenclature. In a similarly confounding move, Central Boulevard is less than a mile away from Center Street, and it changes names three times within five miles. Thankfully many of the other street names are simplistic and roll straight off the tongue, like Okeechobee, Loxahatchee, Coosawatchie, and Caloosahatchee. Jupiter is internationally recognized for a variety of reasons and reflects a level of prestige reserved for some of the most desired locations in the United States. Numerous celebrities and business people have made Jupiter their home, famously beginning with Burt Reynolds, who still has his name on a local waterfront park, as well as gracing a former theater and museum. More recently sport stars have flocked to Jupiter in droves, most notably golfers and those associated with the golfing industry. Recently Tiger Woods put his name on his new restaurant, The Woods Jupiter, but Jack Nicklaus, the Golden Bear himself, has a plaza and a children’s hospital bearing his name. Not to be outdone, Michael Jordan and multiple sports related investors recently acquired a pristine strip of land abutting Jupiter Inlet for a massive fine dining restaurant. NFL Hall of Famers and team owners alike enjoy their off seasons here, which aligns nicely with baseball’s spring training in their backyards. We have met people from around the world who immediately recognize Jupiter, Florida and equate it with various famous people and prestigious places. Through industry events like photography conferences and workshops, we have been able to meet a lot of wedding photographers from across the country, then meet them again in Jupiter when they travel to see their favorite baseball team during spring training. We are happy to host casual gatherings as their favorite Jupiter Wedding Photographers, but our photographic counterparts from St. Louis frequent the area to see their hometown St. Louis Cardinals play at Roger Dean Stadium. Tickets are a little more challenging to acquire when they play the hometown team of one of our many transplants, primarily the New York Yankees or our personal favorite, the beloved Boston Red Sox. The Miami Marlins make Jupiter their spring home as well, as do each home teams’ minor league counterparts, the Palm Beach Cardinals and the Jupiter Hammerheads. Roger Dean Stadium is also a wedding venue, for those who like to be a part of the baseball experience. Personally, we appreciate having the stadium here and welcome all the sports loving tourists, but we’ll always be partial to Fenway Park. Chatting with guests at Palm Beach weddings, Jupiter is often revered for its blend of charm and attractions. A few years ago, we both fell in love with our National Parks system, so many of our favorite local activities lean towards the natural side. Riverbend Park in Jupiter Farms is three mile drive for us to get out of town and enjoy hiking trails, wildlife, natural Florida scrub pine scenery and a provides us a great place to test our our newest camera gear. Riverbend is also home to a rental facility allowing you to bike through the park or take a canoe through the wilderness, past Trapper Nelson’s 1930’s cabin and former zoo, into Jonathan Dickinson State Park. Much like Jonathan’s Landing, the park is named for Jonathan Dickinson, a Quaker merchant whose trip to Philadelphia from Port Royal, Jamaica was severely interrupted by his untimely shipwreck in 1696 on the beaches of what is now Jupiter, FL. Further west in Jupiter, the newly opened Pine Glades Natural Area has become our new favorite spot for sunsets across the sweeping canals, lakes, and native grassland. For a more riparian experience, Sawfish Bay Park and Jupiter Island Park offer canoe and boat launch facilities for those looking to explore the Loxahatchee River and Intracoastal Waterway. Many Jupiter weddings and nearly all Jupiter Island weddings incorporate the waterfront aspects of the locale into the events of the day. We have photographed newlywed couples arriving via boat to their reception, rehearsal dinners held on yachts, engagement sessions in the surf by the jetty, and groomsmen taking a speedboat out for a spin. For those enjoying a longer stay in the area, why not try paddle boarding in what many consider the paddle boarding capital of Florida? Jupiter Outdoor Center, located at the end of Love Street, is one of the best places to rent paddle boards as well as kayaks, both for service and convenience. Viewing Jupiter from the water at a relaxing pace is an excellent way to take in the sights and get a solid core workout at the same time. The most famous sight to see is the Jupiter Lighthouse, serving as a symbol of the area since its construction in 1860. There is a lighthouse on all of the “Welcome to Jupiter” signs when you enter the town, and you will see it on the aptly named Lighthouse Park, Lighthouse Restaurant, and even the Lighthouse Elementary School. Technically named the Jupiter Inlet Light, the 105-foot brick structure is still in operation and has been under the control of the US Coast Guard since 1939. Down the sand dune is a museum which is the jumping off point for daily guided tours, which were only offered one day per year when Steve and his family moved to the area in 1990. In addition to having a small beach and some athletic fields in the adjacent Lighthouse Park, the area at the base of the Lighthouse is available for weddings. A giant banyan tree looms over the wooden boardwalk leading from the tower to an overlook of the Jupiter Inlet, and it’s one of Em’s favorite locations to attend a yoga class, held at twilight each Monday. The Lighthouse itself is easily visible from restaurants across the inlet, multiple bridges, and portions of Jupiter Island, while the beam of light it casts travels 28 miles over the open ocean, as well as back to our home several miles to the west. As you can see in our wedding photography and the wedding photographs of other photographers working in the area, golf courses play a major role in the economy, tourism, lifestyle, and backdrop of eastern Palm Beach County. In Jupiter alone, Admiral’s Cove, Jonathan’s Landing, and Frenchman’s Creek have been long standing communities with their own exquisite golf courses. Joining them more recently are the Bear’s Club, the former Ritz of Jupiter, and Jupiter Country Club, all of which host numerous ceremonies and receptions for locals and visitors alike. Admiral’s Cove has recently opened its newly redesigned club up to the public for events, offering views of the golf course, waterway, and collection of boat, yachts, and marine vessels of all sizes. At a recent wedding at Admiral’s Cove, previous clients’ sounded the horn of their boat to celebrate the first kiss of another couple we were photographing. We were also privileged to document one of the first weddings at the newly constructed Jupiter Country Club just west of our house. It was a beautiful and memorable day, followed by a three minute drive home. While Jupiter is home to a multitude of professional golfers, neighboring Palm Beach Gardens is home to to some of the most prestigious golf courses and clubs. The Country Club at Mirasol and the entire Mirasol development has been constructed since 1990 and it has always hosted a PGA tour event. That event, The Honda Classic, is now hosted at famous PGA National directly across the street. 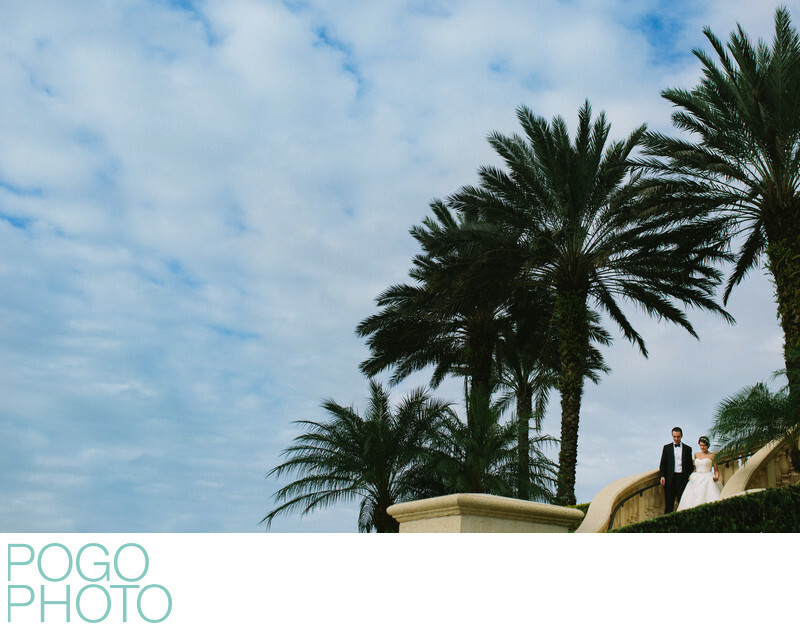 PGA National Resort and Spa has been the location of some of our weddings, engagement shoots, and even a getting ready space for both brides and grooms. The hotel connects to ballrooms and restaurants, all opening up to multiple pools and potential outdoor event spaces, leading to the fleet of golf carts we take out for blissful sunset rides to some of our favorite photo spots. Ballenisles is the third of four golfing communities straddling PGA Boulevard and Florida’s Turnpike. A private community, Ballenisles pairs 36 spectacular holes of golf with a their tennis facility, top ranked in the country. We saved the best for last, as we are simply enamored by Old Palm Golf Club and the opportunities it presents. At a recent wedding, the groom and his groomsmen took in a quick nine holes while the bride and her bridesmaids relaxed through their hair and makeup application while overlooking the massive waterfall at the 18th hole. A relatively small and private club, Old Palm has grandeur and elegance while still feeling comfortable and approachable, a perfect blend for a wedding day. As occasional destination wedding photographers, one of our favorite parts of wedding travel is the opportunity to try great restaurants and experience new culinary adventures. In Jupiter, we have some hot spots we can steer people towards when they are traveling from out of town. Many of the great restaurants are on Palm Beach Island, but Jupiter hold its own in the foodie scene. When people are looking for the Florida feel and some Floribbean food, we adore Guanabanas Restaurant. Guanabanas offers locally caught fish, Florida oysters, clams, and occasionally shark, served among the tiki huts with live music emanating from their own stage. Across the street are Jetty’s, Schooners, U-Tiki, and the infamous Square Grouper Tiki Bar, where the music video for local resident Alan Jackson’s song “It’s Five O’Clock Somewhere” was filmed. Further inland are a pair of chef driven sister restaurants, Little Moir’s Food Shack and Leftovers, where no one is afraid of flavor and distinctive pairings of ingredients linger in your memory long past your trip back home. Working as Jupiter Wedding Photographers allows us to be a part of the local community while still having a worldly perspective, both by traveling and by interacting with clients from abroad. Whether planning a local wedding in your backyard, an elaborate ballroom reception for you and a few hundred of your closest friends, a simple elopement or a casual beachfront ceremony, Jupiter, Florida offers everything from picturesque natural areas to grandiose country club venues. Whatever type of wedding celebration you choose, this Jupiter wedding photography team is ready to artistically capture unique moments of your big day. Location: Old Palm Golf Club, Palm Beach Gardens, FL. 1/8000; f/4.0; ISO 400; 35.0 mm.